Her Latest Happy Thing | Are You Zhazha? 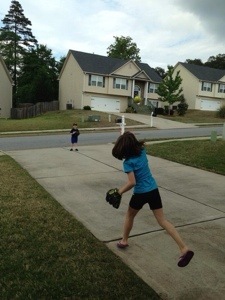 It all started this summer when Nate and Nia began playing wiffle ball in our driveway. 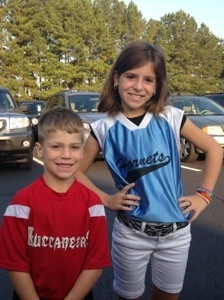 Nia became interested in the sport that she’s watched her brother play season after season. “Can I have a softball glove?” she soon asked us. Yearnings for a bat, helmet and bat bag followed next. Before we made the purchases though – we needed to know – was she going to use all this gear to play on a softball team? Or just when we go to the field as a family to play? Without hesitation, she said yes, she wanted to be on a team. Since we were purchasing all that gear, we told her she needed to give it at least a season. Now that the season has started, it seems the gear will be used for a few more. 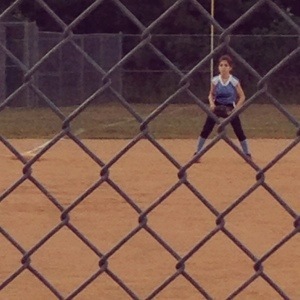 Softball is the new “happy thing” she tells me before falling asleep most nights. She loves it. Even after a loss or a strikeout, she happily chants the dugout cheers (even hours/days after the game) and has even started teaching them to Nate. I’m so proud of her for trying something new that’s challenging for her. She’s doing great but this isn’t coming as easily for her like many other things have. Doing well in school hasn’t been a worry at all yet. Getting along with others is going swimmingly. She feels confident during dancing and I think she really rocks at clogging. 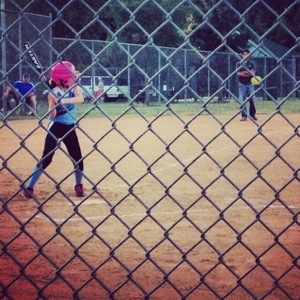 Softball is something that’s requiring her to practice hard, overcome disappointments, and understand what it’s like to be a part of a team. I love this for her and can’t wait to watch her growing moments on the field.